With a return to the sequel trilogy era in the form of The Last Jedi on the horizon, it becomes only natural to wonder about the place of Rogue One (a standalone story) in the cultural zeitgeist. In many ways, this film–that was highly successful on a number of fronts–has essentially slipped from the public’s consciousness. But with “In the Name of the Rebellion,” this week’s episode of Star Wars Rebels, Rogue One: A Star Wars Story gets a powerful burst of relevance. Written partially by Gary Whitta (one of the writers behind Rogue One), “In the Name of the Rebellion” brings back characters, locations, and situations from the popular film and incorporates them seamlessly into the Star Wars Rebels narrative. We’ve seen both Saw Gerrera (“Ghosts of Geonosis”) and Mon Mothma (“Secret Cargo”) in Rebels before, but never together. In fact, “In the Name of the Rebellion” is the first time we’ve ever seen the two interact on screen, and their exchange outside the Massassi temple on Yavin 4 not only illuminates the pair’s relationship but also explains the tenor of Mon Mothma’s comments in Rogue One about Gerrera’s dangerous tactics. These two bastions of leadership within the Alliance to Restore the Republic are very much at odds regarding how to fight the Empire. Gerrera is much more a “ends justify the means” type of fellow, whilst Mothma clings to her principles, arguing that they are the biggest difference between the Rebels and the Imperials. Fittingly, Ezra Bridger finds himself caught between the two philosophies as he struggles to abide by the Jedi code of honor while his home planet of Lothal is currently under siege (as Gerrera’s Onderon once was). “In the Name of the Rebellion” certainly sets up an interesting parallel between Ezra and Saw, and one doesn’t have to make much of a leap to imagine Bridger’s final destiny mirroring Gerrera’s if the writers so choose to go that route. However, in this part of the timeline, Ezra chooses to abide by Mon Mothma’s instruction and therefore joins Sabine (who certainly seems to back full-time as part of the Ghost crew) in a daring mission to tap into an Imperial relay station. What follows is a beautifully shot sequence full of daring dives, shifting landscapes, and exquisite piloting by Hera. There’s also a powerful demonstration of Kanan’s ability to “see” through the Force which effectively addressed my concerns from last week about Rebels glossing over his blindness. Kanan Jarrus has simply reached another level in his ability to use the Force reflexively. But despite our heroes’ skill and bravery, the mission still manages to go awry, and seems destined to fail. But a last-minute appearance by Saw Gerrera and Edrio Two-Tubes in their U-wing “salvages” the operation and rescues Sabine, Ezra, and Chopper. Having previously argued for the destruction of the relay tower, Saw ultimately gets his way by destroying the station himself. It seems that Saw is not one to take “No” for an answer and that mentality leads him to tacitly kidnap the three Spectres in order to help him infiltrate a civilian freighter. “In the Name of the Rebellion” begins its second half with Saw’s mission to pursue a lead he believes will eventually reveal the weapon the Empire is building. Much of this installment plays out in “cat and mouse” style with the four rebels sneaking around the freighter trying to avoid detection. Their investigation reveals little hard evidence in terms of the actual specifics of the project, but they do find a cadre of reactor technicians and an enormous Kyber crystal–not to mention the squadron of Death Troopers guarding the payload. 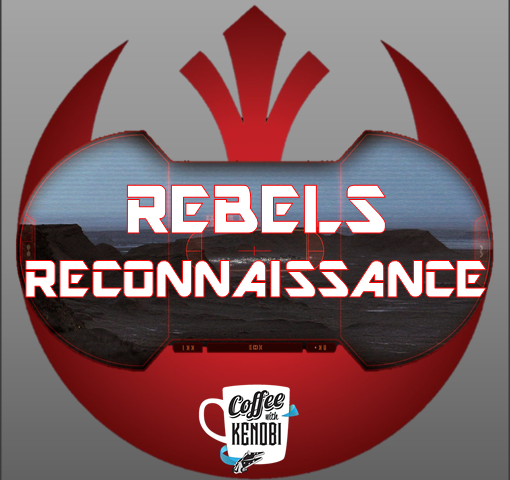 For viewers familiar with Rogue One and A New Hope, these pieces (and a reference to Director Krennic) clearly point to a Death Star nearing completion, but Star Wars Rebels in general (and “In the Name of the Rebellion” in particular) does a wonderful job of not spoiling the surprise for the uninitiated. I’ve taken the show to task in the past for holding to closely to its “kid’s show” status, but on this point I have to give credit to Rebels’ creators for acknowledging that the program is someone’s (and probably many someone’s) first foray into Star Wars. In any case, Star Wars Rebels gives us a fun ride and provides some much-appreciated connective tissue with “In the Name of the Rebellion.” How the Ghost came to be on Yavin 4 is established here, and we see a Saw Gerrera and a Mon Mothma very much on their way to who they’ll be in Rogue One. And despite her reservations about his methods, Mon will soon find she needs Saw as his dogged pursuit of the Empire’s secret weapon creeps ever closer. Hi I’m very excited to see where rebels will end up and when we will see them in the battle of scarrif but there is one detail i think you may have messed up on the freighter they boarded it is an imperial freighter that happens to be carrying the kyber crystal for the Death Star presumably but it has civilian prisoners on board. And I I read it right you said it is a civilian freighter.